When Ana Ribeiro quit her steady government job, sold everything and flew from São Luis to London to study game design back in 2010, her family and friends thought she had lost her mind. In the end, though–with the help of the Unity engine and a healthy dose of talent, energy and optimism–Ribeiro was vindicated. She now has a collaboration deal with ARVORE Immersive Experiences, and her Pixel Ripped game is winning fans, recognition and awards even prior to its release. 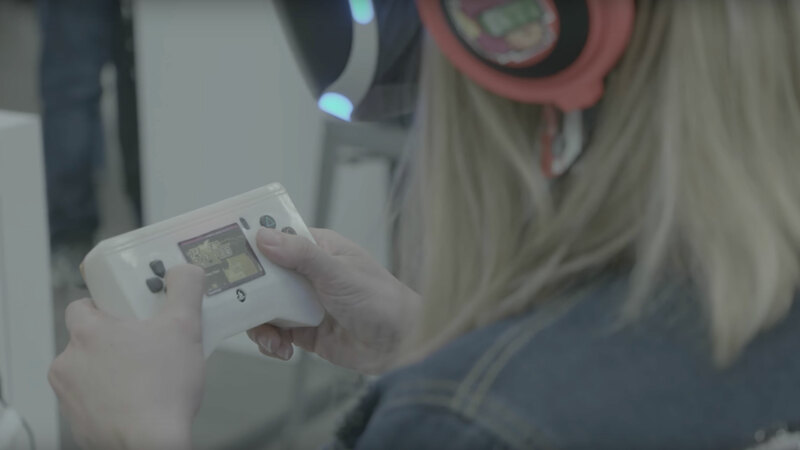 Inspired by a combination of the warm, nostalgic feelings she had for the Game Boy titles of her childhood plus her excitement about the latest VR technology, Ana Ribeiro had a vision of a game within a game. However, creating a retro 2D game within a VR experience did present certain technical challenges. The Unity platform has enabled her to tackle those challenges by making it significantly easier to polish the final product and keep the framerate up. Ana Ribeiro, Founder, Project Manager, and Lead Developer at Pixel Ripped, talks about developing a hybrid 2D and VR game. Sit down, put on your VR headset, and get ready to travel back to 1989. Look around: you’re back in high school, kid, and your goal is to complete levels on your handheld game console without getting caught by your nagging teacher. Pixel Ripped started as Ribeiro's final-year game design project at the National Film and Television School in London, where she was first introduced to Unity. In the beginning of her studies, though, she didn’t have the benefit of the game engine. So when Ribeiro was introduced to Unity, she says she couldn’t believe her eyes. “Some of my fellow students were complaining: ‘Oh my God, we have to write a line of code.’ But I was so excited. I was like: ‘Wow, everything’s ready; I can just put the camera there. I can just grab the physics and add it. It was love at first sight,” she says. When she started developing Pixel Ripped, Ribeiro had the basic idea of a nostalgic time-travel journey to the gaming era of her youth. In order to see what might work and where to focus, she tested early demo versions on her fellow students. During testing, Ribeiro experienced two epiphanies about what were the worst and best elements in her game. The first revelation was that players absolutely hated a certain character, not loved to hate, but actually just hated. Ribeiro had thought it would be humorous to have the main character’s boyfriend dancing in front of the TV. “I thought it was going to be funny because that’s what it’s like in real life when you’re playing a game on the TV and people are crossing in front of the screen annoying you. But people got really mad at this guy. They wanted to hurt him. There were like 40 testers who all wanted to kill the guy,” she says. So instead, she got rid of that character and focused on the part of the demo that resonated with everyone. “Initially, the little moment in the game that everyone loved the most wasn’t even going to be important. It was when you follow the main character in first-person point-of-view as she comes out of the console and jumps to another console,” Ribeiro says. Ribeiro now had the key to producing the right atmosphere that she was looking for . She now knew how to give people that happy, old-school gaming feeling mixed with modern technology. At least in terms of the narrative and gameplay. But there were still technical challenges to overcome. The solution was to go through the game and polish everything in order to make it as light as possible. But that requires time, resources, and the right tools. With that in mind, Ribeiro says that the Unity Asset Store has been invaluable enabling her to increase fps by 20. A lesson learned the hard way: Look on the Unity Asset Store first! Ribeiro learned the hard way that it made sense to browse the Unity Asset Store for the right tools before building something on her own. She recalls one particular incident that really drove this lesson home when still at school working on the project with one of her fellow students. “We were trying to model this Christmas tree, and we saw one for five dollars on the Asset Store. But we really wanted to make everything in the whole 3D part of the game ourselves, including all the modelling. If we had just bought the tree on the store, it would’ve saved us a month of work and stress, and a little bit of disappointment, trying to get it right. I’ll never forget that,” Ribeiro says. She has used a number of Asset Store tools for effects to create the unique mix of 80’s nostalgia and futuristic time-travel feel of Pixel Ripped. For example, she used Shader Forge to produce the pixelation at the start of the game when you travel back in time. She has also used Skybox for around 300 image effects. Ribeiro even found an asset specifically for the nostalgic feel of her game, which creates an 80s-style blue-camera effect. Another feature in Unity that saved Ribeiro and her collaborators lots of time and headaches was the multiplatform support. Having worked in VR from the beginning of her project, Ribeiro followed both the changes in VR technology and how Unity supports it.